This guide is designed to assist students enrolled in Journalism courses with locating Library resources for their research paper assignments. The guide is organized into steps that cover the basic research process: identifying a topic, locating relevant sources, and citing sources used to write the paper. For general research assistance other than Journalism, view the links listed under Research Tools. Books and other Library materials can be searched using the Online Catalog. Books for Journalism are categorized under sections PN 4699 - 5659 of the Library's collection. There are two categories of books in the Library: general and reference. General books can be checked out and are often used for more in-depth research. Reference books do not circulate but can be useful for acquiring an overview on a topic. Reference books are located on the upper floor of the Library and circulating books are in the "Stacks" on the lower floor. -- A new chapter with expanded guidance on polls and surveys -- New guidance on emoji, including how to quote emoji and its proper plural usage.-- A new entry on marijuana and medical marijuana adds more terminology and usage details.--Biracial/multiracial is now acceptable when relevant, though one should be specific about a person’s background when it’s pertinent. Avoid mixed-race unless the story subject prefers that term -- A new entry on act, amendment, bill, law, measure, ordinance, resolution, rule and statute explains the distinctions-- Beginning a sentence with a numeral-and-letter combination is now allowed: 3D movies are drawing more fans-- Other new or revised entries include sexual harassment and sexual misconduct; survivor; victim; homepage; lists and bulleted lists; today and tonight; LEED; coworking; HIPAA; gig economy; and storm names -- Nearly two dozen entries, ranging from matcha to churros, have been added to the food chapter. Media bias has been a hot-button issue for several decades and it features prominently in the post-2016 political conversation. Yet, it receives only spotty treatment in existing materials aimed at political communication or introductory American politics courses. Evaluating Media Bias is a brief, supplemental resource that provides an academically informed but broadly accessible overview of the major concepts and controversies involving media bias. Adam Schiffer explores the contours of the partisan-bias debate before pivoting to real biases: the patterns, constraints, and shortcomings plaguing American political news. Media bias is more relevant than ever in the aftermath of the presidential election, which launched a flurry of media criticism from scholars, commentators, and thoughtful news professionals. Engaging and informative, this text reviews what we know about media bias, offers timely case studies as illustration, and introduces an original framework for unifying diverse conversations about this topic that is the subject of so much ire in our country. Evaluating Media Bias allows students of American politics, and politically aware citizens alike, the means of detecting and evaluating bias for themselves, and thus join the national conversation about the state of American news media. The First Amendment Bubble examines how unbridled media are endangering the constitutional privileges journalists gained in the past century. Covering topics ranging from web filters to laws aimed at preventing the flow of information, this book explores freedom--and censorship--of the Internet and considers the advantages and disadvantages of policies at each end of the spectrum. * Introduces key concepts and traces the evolution of Internet censorship from its earliest days * Shows how anti-censorship groups--including the American Civil Liberties Union, the OpenNet Initiative, Reporters Without Borders, Anonymous, WikiLeaks, and the Censorware Project--band together to fight for freedom of information * Explores the role of American businesses in facilitating Internet censorship abroad * Shares opinions on Internet freedom versus Internet censorship from experts in a range of fields, including criminology, political science, philosophy, and psychology * Includes an overview of Internet usage and penetration rates by region and an examination of the Freedom on the Net 2012 findings. This book tracks the history of news in ten countries over the course of four centuries. It evaluates the unexpected variety of ways in which information was transmitted in the premodern world as well as the impact of expanding news media on contemporary events and the lives of an ever-more-informed public. MOJO: The Mobile Journalism Handbookis the first book devoted specifically to training citizens, journalism students and media professionals to produce professional-quality videos with only a mobile device. As journalism becomes increasingly competitive, students and emerging professionals need a broader skillset to make themselves more employable, whether as mainstream or entrepreneurial journalists. This book by Dr. Ivo Burum and Dr. Stephen Quinn, world experts in mobile journalism, provides comprehensive coverage of all the skills and practices needed to be a mobile journalist. Key features: Burum and Quinn underline the importance of story and storytelling, the crucial context journalists always need to keep in mind. Other books and tutorials merely offer step-by-step guidance to mobile technology and apps. The book synthesizes the knowledge and more than 70 years of combined expertise of two of the world''s leading mobile journalism practitioners, offering sage advice and tips from people who have trained mojos in more than 20 countries. Companion Website: How-to videos on the companion website offer powerful ways for learners to absorb the content easily, walking them through the key mojo components of research, shooting, scripting, voice-over, editing and post-production. Reporting from Pakistan, Russia, Turkey, Egypt, and Mexico, among other hotspots, the author finds journalists under threat from all sides. The result is a growing crisis in information--a shortage of the news we need to make sense of our globalized world and fight human rights abuses, manage conflict, and promote accountability. The author takes twenty-five archetypal news stories and submits them to unusually intense analysis with a view to helping the reader navigate a news-soaked age. He raises such questions as why are disaster stories often so uplifting? What makes the love lives of celebrities so interesting? Why do we enjoy watching politicians being brought down? The book provides an overview of newspapers during Colonial times through the early 1980s, and then turns to demonstrating how new communication technologies have changed the very nature of news writing and delivery. A national, daily, independent news program that provides easy access to diverse sources of news and information. The program broadcast on Pacifica, NPR, community, and college radio stations, etc. An A-Z Topic Index is located under the "Topics" button at the top of the homepage. A nonpartisan, nonprofit “consumer advocate” for voters that aims to reduce the level of deception and confusion in U.S. politics. Monitors the factual accuracy of what is said by major U.S. political players in the form of TV ads, debates, speeches, interviews and news releases. FAIR is a national media watch group that has been offering well-documented criticism of media bias and censorship since 1986. See under the heading "About" for a list of topics and issues. A list of recommended Web sites provided in the textbook, Inside Reporting, 3rd ed. Display the front pages in their original, unedited form each day to more than 800 newspapers worldwide. The project employs a variety of empirical research methods to analyze whether people are getting the information they need for a functioning society. It publishes research on who is reporting the news and what new players are emerging. Useful sections include Topics and Journalism Organizations. The Library maintains a collection of instructor reserve materials. These consist of textbooks, videos, and supplemental course materials that instructors have put in the Library for student use. To find what materials are available for Journalism, search Course Reserves in the Online Catalog. It is best to search by "Course Number" (ex. JOUR 108) in that an instructor other than yours may have placed an item on reserve. Materials can be requested at the Circulation counter and generally must be used in the Library on a two-hour loan period. Photocopy machines are available for 10¢ a copy. The most common way to cite sources in Journalism is the Associated Press (AP) Stylebook. 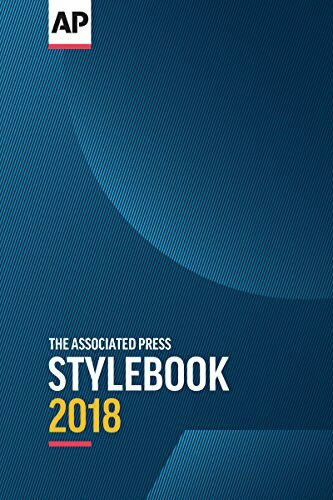 A copy of the stylebook is available in the Library Instructor Reserves collection under the call number: JOUR/Cromshow 01.